Garden reception ceremonies are perfectly suited for couples who have a great love for the outdoors and the beauty of greenery nature. 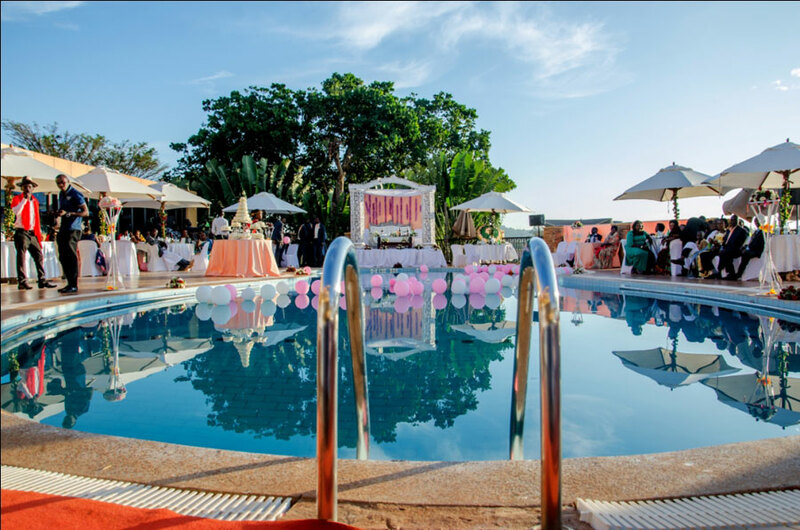 Renzioni Hill, a wedding planner in Uganda says garden venues are common and mostly hired since most people rarely have such well-tended gardens, except for traditional marriages where people use their home compounds. He adds that such hired gardens are designed to be evergreen and so a client does not need to worry about the costs of maintenance. Here are a few top tips for couples looking to have their reception in a garden. Having your reception in a garden will bring out the beauty of your decor, on in this case cake, as the lighting during the day is sufficient and highlights the natural colours well. Renzioni says that is important to consider the budget set because garden receptions tend to be expensive. 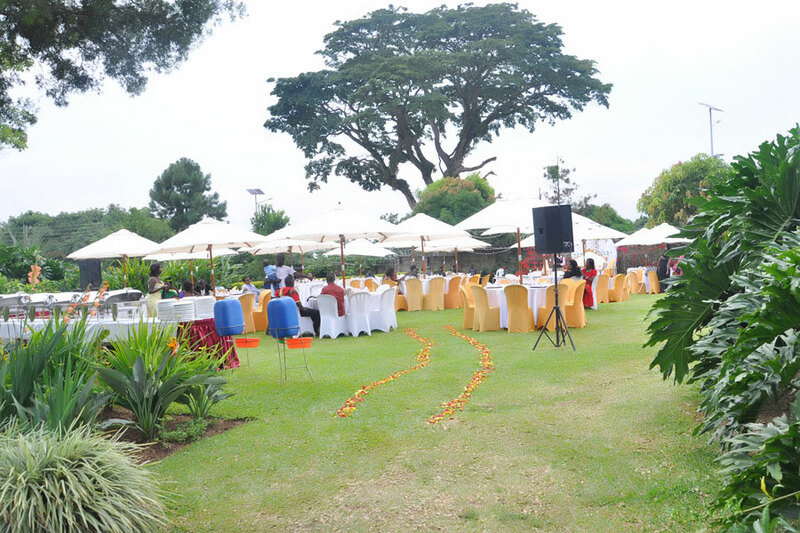 “This is because for venues like hotels the service providers can also be provided for while for gardens you have to cater for the costs of hiring those vendors including the venue itself at different prices,” he explains. Renzioni says that for a garden reception there are costs for hiring a generator that should have sufficient fuel to power the sound of the music, microphones and also lighting, yet in a hall reception, these are usually part of the package. He says that generally, the couple should be ready to budget to cater for all these additional needs for it to be successful. Find out what other facilities the garden has and which might be free to use for decoration or storage and make use of them. 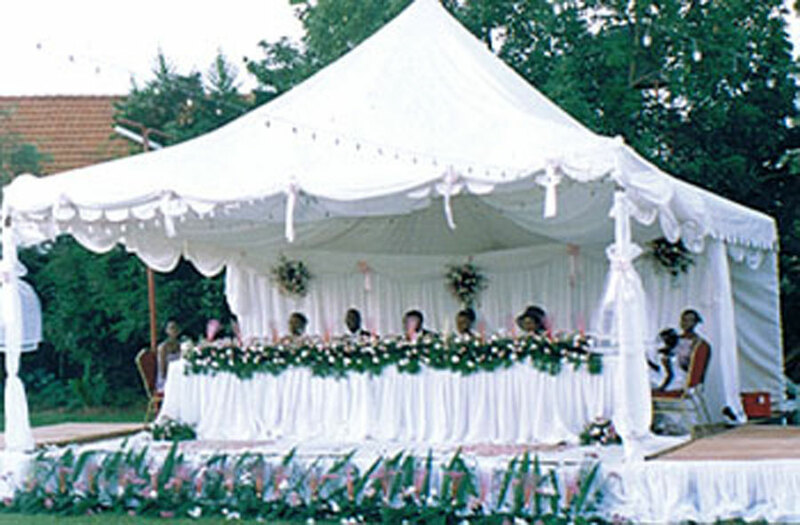 “The number of guests matters because it determines how many mega tents you have to hire, the chairs and tables and the amount space needed at the gardens,” says Renzioni. This is the first thing to consider when planning a wedding, especially in public gardens. Some events will need special permits, which must be organised in advance. 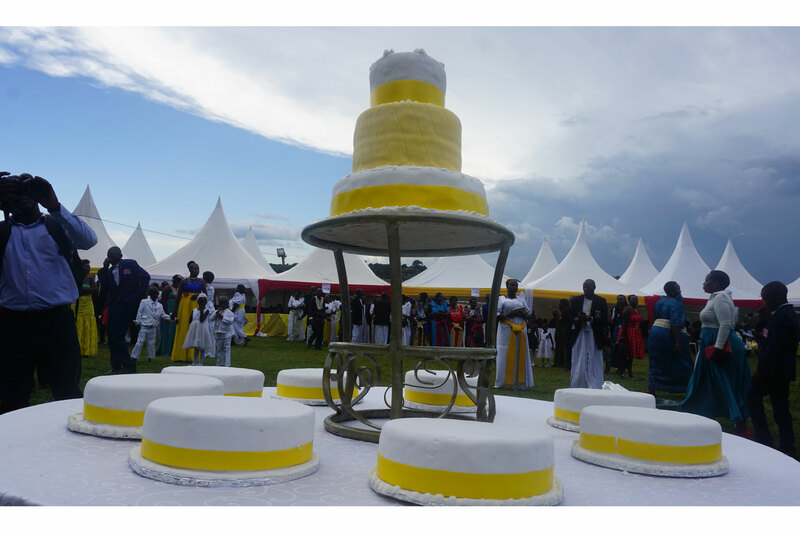 Douglas Okwera, a boda-boda cyclist reveals that for his brother’s wedding at Yes Centre, Nsambya grounds, they had to first ask for an acceptance letter from the Local Council Chairman(LC1) of the area before they could proceed to hold the reception there. Weather is a major factor that one should put in mind because it won’t always be sunny. According to Renzioni the weather is unpredictable in Uganda and weather forecasts not entirely dependable. Pastor Patrick Nagaya, a preacher with University Community Fellowship in Makerere-Kikoni and the owner of Patrima Events, adds that when it is wet, the grounds become slippery and the mud can end up soiling the brides’ gown. “This should also be in consideration for the ladies who are wearing wigs and flowing dresses,” Nagaya says. This brings to the aspect of having a good Plan B, like hiring gardens that have a hall next to it to shelter guests in case the weather interrupts the function. A nearby hall is also needed for the bridal entourage to have a room for changing their outfits from, for the evening session. A wedding from 2004 shows how intimate weddings were, yet they still managed to look beautiful. Nagaya advises couples to be mindful of the theme colour so that it complements the green environment as well. He says that sometimes some couples choose some dull colours that fail to bring out the desired beauty. So he advises opting for bright colours and lots of flowers because the beauty of floral arrangement is well illustrated during an outdoor event. Ensure that there are facilities in place that will be accessible for your guests like toilets. Since these days there are mobile toilets, a couple can budget to hire these in case the venue lacks them. Nagaya insists that a couple should ensure convenient and hygienic toilet facilities are available before paying for gardens because mobile toilets may be costly yet the money can be used to cover other items. Enough chairs should be hired because you would not want your guests seated on the grass. And the availability of parking space is a must for your entourage and guests’ vehicles. Since a garden venue is usually open, it is advised to hire one that has a perimeter wall around for easy monitoring of the security. It is actually important to find out how many security personnel should be deployed at your venue depending on the size of the gardens. Although gardens are beautiful places, remember that they come with insects and bugs and so you might have to plan for that. Justine Namakula a policewoman at Nsambya Barracks says that a policeman can accept to guard a venue for like shs 100,000 –Shs 300,000 depending on the venue or if your negotiation skills are good. Remember that the gardens bring with them the possibility of insects like ants, bees and mosquitoes. Nagaya advises ladies to use mild sprays because strong perfumes attract bees to the setting. “And also the grounds need to first be fumigated to clear out the habitats for ants and mosquitoes, which will bite your guests in the late evening,” he advises.